A baby boomer's first 'fowl adventure. Yeah, I know what you're thinking, "Ahh geeze, here we go again. Another one of those warm and fuzzy, sittin'-by-the fire, toastin' marshmallows stories." Like it or not, that's how my first duck hunt started. Yes, my first hunt&apos;¦ever. Well, maybe not ever. 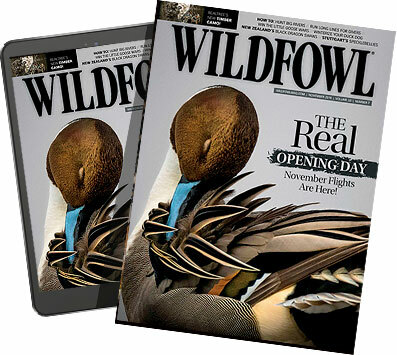 I do remember hunting for Easter eggs as a kid and I did have to hunt for my car keys a couple of times over the years, but I sure don't remember unloadin At 58 years of age and on the leading edge of the baby boomer generation, I decided to enter a sport where many hunters my age are hanging up their waders. For the baby boomers that are finally thinking of entering the sport of wingshooting for the first time&apos;¦here's a story of one, older, first time hunter. It was a cold, crisp, early October morning, the kind that makes the hairs in your nose take notice with each breath. It had been sometime since I had been to the Iroquois National Wildlife Refuge in upstate New York. I couldn't recall exactly how long a drive it was, so I set my alarm to give myself plenty of time to dress, double check my gear list and wrestle with driving conditions. The unconventional beeping of my digital alarm clock interrupted my sleep at about 3 a.m. Interrupted...hell, I'd been turning side to side in bed almost every half hour glancing at the clock to make sure the alarm hadn't failed...It hadn't. The excitement of my first duck hunting adventure was about to commence. I had laid all my clothes out the night before so I was dressed and ready to rock 'n' roll in about 15 minutes. I went through my checklist again as I panned the smorgasbord of equipment in the back of my minivan. Once satisfied, I removed the frost from the windshield and hit the road 45 minutes later. There was no reason to be concerned about the drive. At 4 o'clock in the morning, the milkman isn't even up. You remember the milkman, don't you? Anyhow, the roads were clear and I was the first to arrive at the permit station about 4:45 a.m.
Vehicles began to fill the lot shortly thereafter and along about 5 a.m., the lights went on in the permit station. Like the announcement of "last call" at the local watering hole, the opening of that building siphoned hunters from their vehicles. I, not wanting to miss the action, followed suit. As I entered the building, I saw a large refuge map on one wall identifying the blinds. The opposite wall held a chart listing the blind numbers along side of which was the number of ducks taken the previous hunt day. One of the fellows reviewing the data was an acquaintance I new from the Clayton Decoy Show in the Thousand Islands. I approached him with an amicable greeting and a handshake and after a little small talk, he offered his expertise as to which blinds I might choose as well as those a novice, like myself, might want to avoid. At 5:25 a.m., everyone was asked to leave the building. I didn't know why, but again, I followed the herd outside into the starry night. As each person stepped outside, they turned to form a line to get back into the building and I, uniformly, took my position in line as well. Once the building was waterfowler free, everyone reentered the building, one by one, showing evidence of a valid hunting license, waterfowl identification card and HIP number. Once the validity of the items was verified, each hunter was given a number and a duplicate was placed in a container. After all hunters checked in, the lottery drawing for blinds commenced. I could feel the tension in the air as the first number was called. "Here," someone shouted and the individual stepped to the counter to claim his territory. "Number 36 is gone," the DEC officer shouted from behind the counter. That triggered several moans from the floor. The draw continued as did the outbursts of jubilation and agonizing groans of defeat. I heard someone call out my first choice and shortly thereafter my second choice was gone. Just as I was contemplating the possibility of returning home empty handed, I heard it! My number! They just called my number! Again, following the lead of my predecessors, I stepped to the counter and proclaimed "Blind 25". I paid my fee, signed the daily permit and exited the building with the strut of spring gobbler. The parking lot emptied rapidly as hunters headed to their blinds to setup before sunrise. The adrenaline was beginning to flow as I headed to my first duck dinner. As I approached the parking area, the headlights from my minivan glanced off waterfowling participants emptying gear from their vehicles. I pulled in alongside a couple of gentlemen loading their gear onto a two-wheel cart. "They must have a lot of gear," I thought, as I stepped out of my minivan. I greeted them asking if they could help me with directions to my blind. They obliged me and said, "just head down this road, cross the ditch and you'll see the blind numbers on a stake in the ground." "Thanks," I said and off they went into the darkness. I opened the hatch on my minivan and began to assemble my own gear. My plan was to wear all my clothing and carry in my gear. I kicked off my sneakers and pulled on a pair of thermal socks over my poly socks. I removed my blue jeans under which I had on a pair of fleece long johns. I then pulled on my waders. A black Labrador retriever startled me as he excitedly ran up, gave my boots a sniff and with a whistle from his master, was off into the darkness. I continued dressing by adding a medium weight thermal liner jacket over a poly shirt and my shell over that. I flung my gun with choke tubes in a case over my left shoulder. My decoy bag went over my right shoulder and my field bag with shells, calls, extra gloves, binoculars, camera and snacks went back to the left side. In one hand I carried my campstool and the other a walking stick and flashlight. I felt like the "Stay Puff Marshmallow Man" in camouflage! I made a final mental check and headed into the same darkness that those before me hath trod. I understood my friend to say, "follow the road to the ribbons and look for the markers with the blind numbers." ccessful, I decided to climb down the ravine and take a closer look. I picked a spot and slowly made my way through brush and tall grass to the bottom only to find it filled with water. At the base of the ravine, I dropped the gear from my shoulders and probed the water with my walking stick only to have it immerse itself in about a foot of thick goo. I thought it was odd that there weren't any signs of other entries. "Where in the hell did those other guys cross?" I thought to myself. Pushing a stick into a mud hole is one thing, but stepping into it with this 285-pound body plus gear, is another story. The thought of attempting a crossing and getting into trouble without help nearby, was a scary thought at this point. Tripping on vines and thick weeds, I struggled up the bank. It was decision time. Do I attempt to cross, or cash it in. I was a bit tired, frustrated and really had no idea where I was going. I decided to return to the car and wait for dawn. I dropped my gear and plopped into the front seat. I dozed off and on for about 30 minutes or so and awoke to the pop of gunfire. Distant light had begun to peek through the trees on the eastern horizon. I heard the distinctive call of a hen mallard nearby and geese honking overhead. I thought about my preparation for this day, taking the hunter safety and waterfowl identification courses, purchasing the appropriate waterfowling gear, investing in a shotgun and the time I spent on the shooting range. I had awakened before the chickens this morning and drove 20 miles. "Nuts," I said to myself, "I came this far, paid my fee and damn it, I'm going to find that blasted blind!" I threw my jacket on and headed down that road. This time I went past both ribbon stakes and with the help of dawn's early light, I could see that the road branched to the right and crossed that damn ditch over a culvert, no muss, no fuss! As I crossed the ditch I spotted the first marker. Numbers 24 - 29 with an arrow pointing left. That was encouraging. But how far down the trail to my blind? There was only one way to find out! Onward I marched. The trail turned right and again left and at a fork in the road, another marker that read, blind 25, oh glorious number 25, to the right. Ohhh, I could taste grilled duck for tonight's dinner. I proceeded down the trail where I could see sunlight glistening on the water. The trees became sparse and weeds and soft ground more abundant. There were a few tired trees in the water accompanied by a few stumps in a small bay with low grasses breaking the water's surface. I walked to the edge and surveyed a most beautiful vista. There were cattails off to my right and two hunters in a stand of dead trees to my far left with two more hunters across the pond. In the middle of this view, about 30 yards out was a stake with a plaque that read "25". I had found the illusive blind number 25 and I was ready to hunt! Unfortunately, in my exuberance to locate the blind, I had left my gear in the minivan. I was again confronted with yet another decision. Do I stay and enjoy the scenery for a while and then call it a day, or head back for my gear and return to the blind for the purpose intended? "I came, I saw, I failed? No way, not me!" The thought of hiking another three quarters of a mile with gear and a barrel of perspiration isn't going to end this adventure. The walk back seemed shorter and my pace quickened as I came within site of the parking area. I gave the ditch a few choice words as I crossed back over. Once I reached the minivan, I loaded my gear onto my shoulders and in the voice of Bluto of Animal House fame, my brain shouted, "Let's do i-i-i-t."
infamous ditch. I paused for an occasional drink of water and to adjust the straps on my aching shoulders. My pace began to slow, stopping several more times to rest parts of my body that hadn't been called into service since my children were little. Once I reached the blind, my shoulders were pleading for mercy as I let the bags slide to the ground. I now understood why those two fellows had a cart. Once rested, I picked up my bag of decoys and trusty walking stick and proceeded into the pond. One by one I placed the decoys in a configuration that would signal every avian passerby, that this was the ideal spot to set down. Now, my decoys didn't flap their wings or bob up and down or sing a rendition of "I'm All Quacked Up Over You," but they looked good. And why shouldn't they? They were the latest and greatest edition of plastic decoys authored by world-renowned carver, Pat Godin. I returned to shore and looked over my rig. It looked pretty good to me, similar to the layouts suggested in several of the "How to Hunt Ducks" books. I took my place under the branch of a tree from which I hung a piece of camouflage net to help obscure my position. I assumed a comfortable position on my stool, uncased my Remington, checked the safety, and loaded three shells into the 870 Wingmaster. Yes, sir...the hunt was on! I'm not sure what time I finished setting up, but I do know it was a beautiful morning. Things were a bit quiet on the marsh. I could hear shots in the direction of the blind my friend had selected, but the gun was silent at blind number 25. Then, suddenly, in the distance I spotted two ducks. I drew the duck call to my lips for my waterfowling rendition of Hail to the Chief. Like two Democrats at a Republican rally, they promptly beat it out of there. The sun continued its ascension and I settled back into my campstool with a couple of granola bars. While consuming my morning meal, a young whitetail emerged from the woods along side of me to drink from the pond before disappearing back into the timber. There was still no action on our marsh as more shots rang out in the distance. An osprey landed on the one remaining branch of a dead tree on the edge of the cattails. I guess he didn't think much of the hunting either. The next time I looked in his direction, he was gone. With a lull in the action, I reached for my cell phone to give my wife a call. I wanted to let her know I was safe and thank her for encouraging me to pursue this life long interest. As long as I took out the garbage and left her the credit card, she was good with it. Well, guess what? Apparently there aren't any transmitting towers within range of the refuge. Thus, my wife never received a call. Not to worry, she probably thought I forgot to call anyway, which she would say was par for the course. At about 10 o'clock, I saw my compadres across the pond begin to gather their decoys. I had heard, on more than one occasion, that weather conditions could effect the movement of ducks. They sometimes don't become active until late morning. Having had nothing to shoot at (yet), I was hoping that perhaps this might be one of those mornings. I continued to gaze skyward, giving an occasional quack on my call, more for practice than tactic at this point, anticipating flashing wings heading for my decoys. l hunters to be out of their blinds by noon. In an attempt to get all of my five dollars worth of hunting time, I stayed to the bitter end. After all, I did lose a couple of hours up front. The skies remained free of birds for that last half hour and around 11:30, I ejected the same three shells I had loaded just hours earlier, pulled up my decoys, packed up my gear and headed out. Walking back, I relived the morning in my head thinking how dumb I was not walking further down the road in the first place, but extremely pleased that I persevered to experience my first solo duck hunt. I returned to my minivan one last time and all that I had so neatly packed the night before, was now being tossed into the back like Monday morning's laundry. The last official duty I had to perform was to complete and return the record of waterfowl taken to the permit station. You are asked to record the number of birds recovered, lost and which specie. I grabbed a pen from the glove box and with the authoritative signature of a British agent, I proudly placed two zeros in the boxes. Birds or no birds, it made no difference to me. To use the fishermen's' cliché, I was hooked. Granted, the process of getting to the blind and back was tiring on these old bones. Come tomorrow, I'll give 'em a rest. As for today, I did it! Not as fast as I might have been some years ago or as strong, and definitely lacking style points. Call it determination, perseverance or just plain stubbornness, I wanted this adventure and I got it, on my own! The end result for me was a greater appreciation for our surroundings and gratification in the adventure itself. As I drove up to the now uninhabited permit station, another car pulled alongside. As we stepped from our vehicles and walked toward the depository, I asked the driver of the other car how he did. "Oh, a couple of mallards," he replied, "How was your day?" I smiled, nodded my head slowly in the affirmative and said, "Fine, thank you&apos;¦just fine. "g a 12-gauge on a hard boiled egg.